This post originally appeared on HousingWire.com. The Federal Housing Finance Agency’s Inspector General (OIG) issued a report in September — “FHFA’s Representation and Warranty Framework” — lambasting the FHFA's failure to adequately assess the risks of its plan to reduce loan put-backs for banks and mortgage lenders. Our analysis of recent, more tailored data, however, reveals that the OIG’s analysis of this sensitive issue is incomplete and overstates the risks of the plan. The OIG report should have been more balanced. The OIG has a job to do, but an incomplete analysis of a sensitive issue raises the question of whether the government is really willing to take the steps necessary to assure lenders that they intend to provide rep and warrant relief. Our research team had the numbers to do this analysis in a more complete manner, so the OIG did as well. Moreover, there should have been greater acknowledgement of the FHFA’s effort to meet public policy goals in a timely manner which, inevitably, involves tradeoffs. A sunset on put-backs is a good way to expand the credit box. Credit remains significantly constrained in the U.S. today: In 2012-2013, the percent of 30-year Fannie Mae and Freddie Mac full documentation amortizing loans made to borrowers with a FICO score under 700 stood at only 7%. It was 36% in 2000-2004. In addition, a lack of clarity about loan “put-backs” is a contributing factor to the tight credit environment. In a “put-back” a Government Sponsored Enterprise (GSE) — Fannie Mae or Freddie Mac — requires lenders to buy back from the GSE a loan that is not in compliance with the GSE’s contractual standards or representations and warranties (“reps and warrants”). When lenders are concerned about high levels of put-backs or lack clarity about what triggers put-backs, they tend to restrict their lending to lower risk applicants, generally those with the highest credit. FHFA, which oversees the GSEs, recognized the chilling effect of unclear put-backs and the critical need to expand the credit box, and began to offer a “sunset” from loan put-backs for lenders under certain conditions. In May of 2014, under new Director Mel Watt, the sunset was relaxed to 36 months, assuming no more than two 30-day delinquencies. The sunset is unavailable, however, if certain "life of the loan" representations and warranties were violated; thus a loan can be put back after the expiration of the sunset if there was a pattern of misstatements, misrepresentations, omissions, and data inaccuracies. The OIG found the January 2013 implementation of a set of sunset provisions to be flawed. The OIG offered two criticisms of the sunset program in its September, 2014 report: that the risks of the 36-month sunset were not sufficiently analyzed, and that the GSEs adopted the revised standards before putting the needed risk assessment tools in place. The OIG asserted that the FHFA had failed to adequately assess the risks of the 36-month sunset period by validating the GSE’s analysis or performing its own analysis of the appropriate balance of risk between the GSEs and the sellers. The OIG quoted Freddie Mac’s analysis of 2004-2006 loans, which shows that 3.7% of mortgages with a 36-month clean payment that defaulted were appropriate for put-back, but this number was reduced to just 1.7% of mortgages with 48 clean months. Fannie Mae calculated that 6.1% of the 2003-2010 loans that defaulted in years 4 and 5 had a significant defect. The FHFA argued in its response that they did adequately balance the importance of expanding access to credit with the need to maintain the safety and soundness of the GSEs. We believe the risks in the OIG report regarding the 36-month sunset period have been substantially overstated. The GSE calculations overestimate the risks, as these estimates are based on all mortgages, not limited to full documentation mortgages, which pose much less risk and are the only mortgages the GSE are currently purchasing. Looking at put-backs on 30-year amortizing full documentation mortgages using the most recent Freddie and Fannie credit databases (see Reps and Warrants: Lessons from the GSEs Experience for our earlier work on this), we find that the put-back risk for these loans is substantially lower than the numbers the OIG report cited. 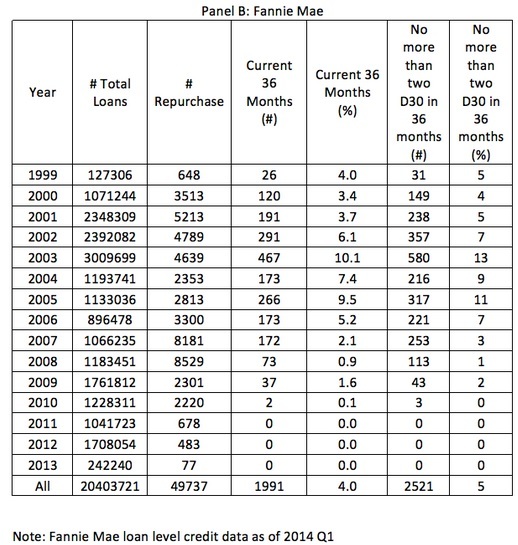 Only 466 loans (0.6%) were completely clean for 36 months, then subsequently repurchased. Even under the expanded sunset provisions, fewer than 1,500 loans (2%) that had two or fewer 30-day delinquencies after 36 months were subsequently repurchased. 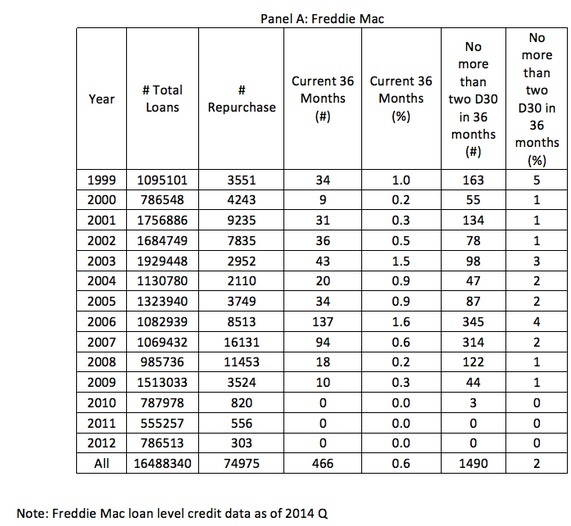 Between 2004 and 2006, the period Freddie Mac examined, there were 14,372 repurchases, but only 191 loans (1.3%) were completely current for 36 months and subsequently repurchased, well under half the 3.7% default rate for Freddie cited in the OIG report. Fannie Mae Analysis (Panel B, Table 1): Fannie Mae tends to repurchase fewer loans at a later point in their life cycle than Freddie Mac, so the impact of the sunset is slightly larger. Out of Fannie Mae’s 20 million 30-year fixed-rate full documentation amortizing loans made between 1999 and 2013, 49,737 were repurchased. Out of the 49,737 repurchases, 4%(1,991) were current for the first 36 months, and subsequently repurchased. Similarly, for the 2003-2010 period cited in the OIG report, 4% of 30-year full documentation amortizing loans were current for the first 36 months and then repurchased, two-thirds the 6.1% for all loans quoted by the OIG. 5.1% of the loans (2,521) that had no more than two 30-day delinquencies were subsequently repurchased. Simply put, an incredibly small number — well under 2,500 — of 30-year fixed-rate full documentation amortizing loans purchased by Fannie Mae and Freddie Mac were current after 36 months (approximately 4000 had two 30-days delinquent) and were subsequently repurchased over the course of the boom and bust cycle. That’s compared to well over 36 million such loans purchased. Given the positive impact this small reduction of uncertainty had on opening the credit box, we believe the FHFA was well justified in its modest expansion of the sunset. The OIG also asserted that the FHFA implemented the new reps and warrants framework before it had resolved outstanding operational risks, particularly the establishment of risk assessment tools. FHFA partially agreed with this criticism as it had not fully established the new processes to provide feedback to lenders prior to loan delivery and data validation shortly after purchase. We believe it was critical for the FHFA to acknowledge to the lender community the fact that access to credit issues was a concern, and that FHFA and the GSEs were willing to take steps to address it was critical. Moreover, the number of put-backs on new GSE purchases that were potentially impacted by this issue was small, and while some tools were in place, developing the systems is a multi-year process. Given these facts, we believe the FHFA’s fast action was more than justified.